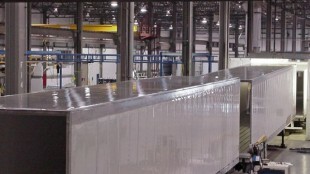 Refrigerated trailers are assembled at Utility’s Clearfield, Utah plant. 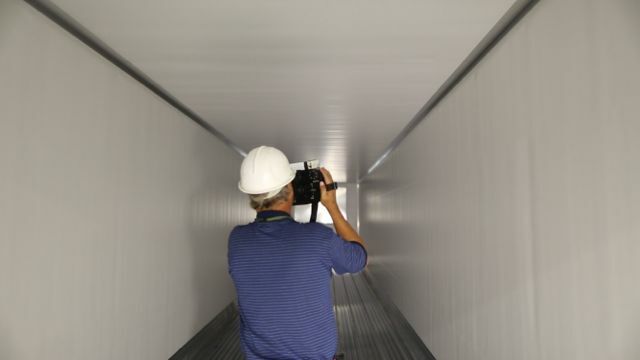 A thermal inspection is conducted on a new refrigerated Utility trailer. CLEARFIELD, Utah — Utility Trailer bills itself as the longest running, privately owned trailer manufacturing company in the US, and next year will celebrate its 100th anniversary. 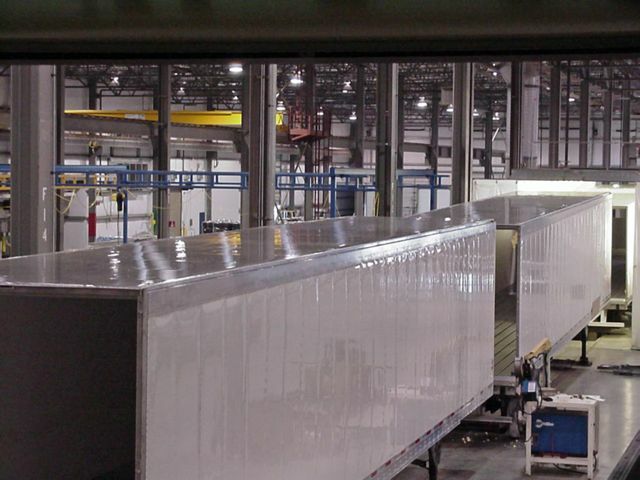 The company claims to be the largest producer of refrigerated van trailers, which are produced at Utility’s Marion, Va. and Clearfield, Utah facilities. Utility has a number of proprietary production processes it says result in a better-built, more efficient refrigerated trailer. Recently, Utility allowed a small group of truck journalists to tour its Clearfield plant, where these highly guarded manufacturing secrets were put on display for the very first time. We followed up the visit with an interview with Craig Bennett, senior vice-president of sales and marketing with Utility, to discuss these processes and other trailer industry trends. TN: Craig, it seems trailer order activity has been up and down throughout the year, with no real sustained increases in demand. How would you characterize the current state of the industry for Utility, and for the trailer industry in general? Bennett: The market generally gets softer seasonally in late summer, then a little stronger in the fall. We had a typical seasonal slowdown in the late summer, July and August, and it got better in September and a little better in October, but it’s not as good as we’d like to see it and it’s not as good as we were hoping it would be. I would classify it as okay. In the trailer industry, we are all operating at very high production output levels and it’s always challenging to maintain those levels with new order intake, once you get the crews built up. That’s the challenge we all have. A 240,000-250,000 trailer year would be a good year by any measure – not a great year, but a good year – and that’s probably where we’re at. We don’t see that changing a lot. There’s a lot of activity, with people looking at stuff going into next year, but with so much uncertainty relative to the health care law, and new regulations that face trucking, for-hire carriers especially are challenged in their ability to make new equipment acquisitions. They’re having difficulty paying for all the new higher-priced trucks and higher-priced refrigeration units. 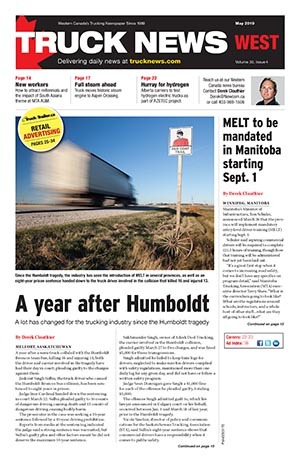 Even the trailers cost a little bit more – not a lot – but passing the costs along in an environment like we have today, where we’re only growing at 1-2% GDP, is difficult. TN: One of the techniques you showed us at the plant is a dipping technique, in which the entire coupler assembly is immersed into a hot liquid to provide a complete coating that protects against corrosion. I know it’s a proprietary process, but coupler corrosion is a big issue for us in Canada. How much can you tell me about the benefits of this process? Bennett: Before we used this process – this material, this heat and the dipping process to get 100% coverage inside and outside of that assembly – upper couplers would last, in the Midwest or Canada, typically seven to eight years and then they would rust out. Since we started this process, they basically don’t rust out anymore. The life is more than double – somewhere in the neighbourhood of 18-20 years or more – depending on the environment they’re exposed to. That weak spot in the trailer has been eliminated in our trailer. That’s an expensive fix when it used to rust out, as you can imagine. You can still beat them up structurally – bang them up, overload them, hit them with a yard jockey – but they don’t rust out like they used to. TN: Another unique manufacturing process you demonstrated was the way Utility insulates the entire trailer, once it has been fully assembled. What is unique about this process and why do you do it this way? Bennett: You get a better-insulated product, ultimately. Instead of building the sidewalls foamed and a floor that’s foamed and a roof assembly that’s foamed and bringing them all together and sealing up 53-ft.-long joints from the floor to the wall on both sides and the roof to the wall and the front wall to the sides, rather than having to try to seal all those things up, we let the foam do that in our process. We build the whole shell, as you saw, the complete body, and then inject the foam using a mandrel process. We inject that foam in there so it goes around all the corners. It seals it up and expands to six times its original size. We build our box very tight with sealer tape, overlapping joints, etc., to make sure the foam doesn’t squirt out on the ground, so we have a complete 360-degree envelope of foam all around the product that prevents moisture entry and it prevents air loss, which is money going down the drain. It just makes a better product. We chose not to go away from that foam mandrel process in favour of a panel process, which all our competitors have done. The reason they have done it is it’s a more production-friendly system, but you sacrifice the quality of the finished product, which we’ve chosen not to do. TN: You’ve also made some changes to the floor design. Tell me about those. Bennett: With the 3000R reefer, we eliminated the floor screws that attach the aluminum floor to the wood pillar underneath. Those were always the spots where the floor would wear out. As the floor pumps up and down and as it flexes going down the road, that’s the area that would always wear out and then you get moisture penetration and corrosion. We created a floor clipping system, where the aluminum top floor surface snaps into those clips you saw, so there is no screw that goes through the aluminum top surface. All the screws are underneath in those clips, and there are two of them where there used to be one that went all the way through the floor. So the stresses have been cut in half and we have not had those things wear out, they just last and last. We eliminated the moisture penetration points of the floor screws, which everyone else in the industry still has, and we have the clipping, which cuts the stresses in half because there are two screws where there used to be one, but they are all underneath. TN: During the tour, we saw several finished trailers, decaled up and ready to roll. You provide decaling on-site. How important is that to the customer? Bennett: It’s really important. Our philosophy is, we want to deliver a road-ready trailer. We want the trailer to be able to go into service and haul freight when it leaves our factory doors. So we have a partnership with an installer who works with their people at all our factories every day. We make space available for them to do that. By doing that, customers don’t only have their trailer decals finished and installed properly, we do it to a very high quality because we have the same people there every day and they are experts in what they do. TN: How many customers take advantage of that option? Bennett: I’d say we put the decals on about 30% of the vans and reefers. We also install refrigeration units, lift gates, walk ramps, toolboxes, load temperature monitoring devices and all types of accessories so the trailer is ready to go haul freight when it leaves the factory. The trailer doesn’t have to be shipped from our place to a decal location to a refrigeration unit location to a lift gate location. That can take a lot of time and be costly to the customer. TN: There’s a lot of customization that I saw taking place at the plant. What trends are you seeing in terms of options customers are looking for today that maybe wasn’t on their radar a few years ago? that go underneath the floor cavity. And a lot of temperature monitoring devices, because with the Food Safety Act that’s coming in the US, truckers are going to have to monitor the cargo temperature from beginning to end and prove the temperature was held at proper set-points while it was in their possession. There are more disc brakes being sold, even though they’re a pretty costly item. More aerodynamic devices, side skirts and trailer tails. TN: As far as the skirts go, are you seeing increasing demand for skirts or has it leveled off? Bennett: I think it’s growing. California is driving it in the west. The economics of it make sense if you’re in long-haul, running 60-plus mph. If you’re running a city operation, it doesn’t make sense. I think we’re going to see a lot more of that, because fuel prices are going to remain fairly high. In an effort to attract owner/operators, some fleets are putting side skirts on their trailers because the O/O pays the fuel bill and if they can lower his cost of operation, it makes the driver want to drive for them more than somebody else. TN: Finally, besides spec’ing aerodynamic devices, what can customers do to lower their cost of operation as it relates to the trailers? Bennett: If it’s a refrigerated trailer, you want to buy a good tight box so you don’t leak a lot of air and run the diesel fuel bill up. I think the single tires is a big thing, you get better fuel economy with single tires, typically. 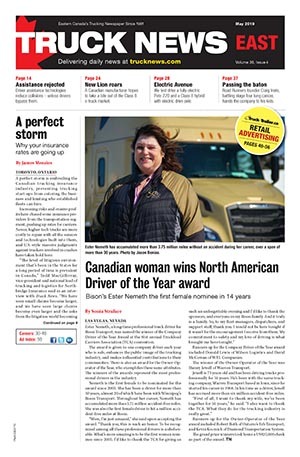 In general, you want to spec’ the trailer for the type of freight it’s going to be hauling. If you’re beating up your floors or sidewalls, additional wear bands, stronger wear bands, stronger sidewall linings, thicker floors. With the price of trucks and trailers these days, people want their equipment to last longer. They want it to live longer so there’s more of a move towards higher-spec’ items. Even if it’s a little bit heavier and a little bit more costly in the short run, if it lives an extra two to three years, they’ve made money in the long run. Great reporting. Very insightful. Solid questions of an industry leader. Thanks.